Winter… it’s time to ski! There are seven mountain ranges (plus Andorra) where you can practise skiing in Spain. If you are wondering if it is possible to eat a gluten-free snack, sandwich or menu on the ski areas, I will tell you: Yes, it is. Cafetería Pista Grande: They offer: broth and chocolate, in the cafeteria. Starters, main courses and desserts, in the self-service restaurant. Ampriu: They offer: broth and chocolate, in the cafeteria. Starters, main courses and desserts, in the self-service restaurant. Cota-2000: They offer: broth and chocolate, in the cafeteria. Starters, main courses and desserts, in the self-service restaurant. Sabinas: Self-service restaurant and sandwich bar. Ham sandwiches, chicken breast and pork loin. Menu of fish and meat on the griddle, broth, vegetables and salads. Anayet: Starters, main courses and desserts. Grill. Sextas: Starters, main courses and desserts. Petrosos: Broth and chocolate, in the cafeteria. Starters, main courses and desserts, in the self-service restaurant. La voglia: sandwiches, broth and bakery. Sabinas: They offer: broth and chocolate, in the cafeteria. Starters, main courses and desserts, in the self-service restaurant. Baqueira/Beret: You can find products and menus in the following restaurants: La Perdiu Blanca, Info-Café, Restaurant 1.800, Self-service El Bosque, Restaurante 2.200, Self Service de Beret Er Adeth, Pàrrec Argulls y Bonaigua. Boí Taüll Resort: All their restaurants, in the ski hills and in the resort, have gluten-free menus. La Molina: They can prepare gluten-free menus by request. Vall de Núria: Gluten-free menus at Vall de Núria Hotel. La Pinilla: Mont Blanc and Hostal La Pinilla offer gluten-free meals. Valdezcaray: Cafetería El Freskito serves gluten-free sandwiches. Borreguiles: Gluten-free breakfasts, meals and menus. Restaurante La Alcazaba: Gluten-free menus. Vallnord: They can adapt the dishes to a gluten-free diet. There are some ski hills from which I could not find any information, but I believe that it is possible to find something to eat safe for coeliacs in their bar or restaurants if you call up in advance and tell the waiter your necessities. I have left the link of the ski hills for you to have the addresses and phone numbers to contact them. 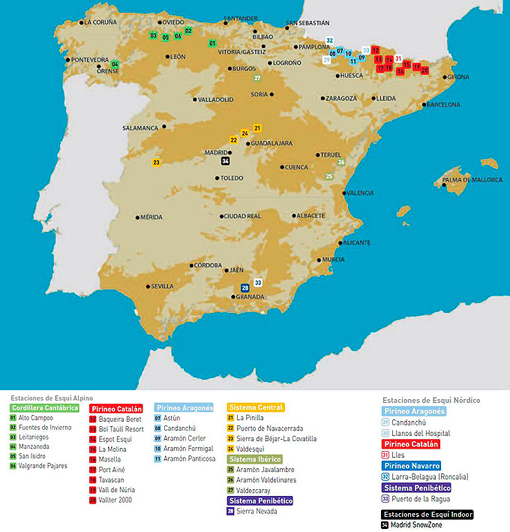 Sources: Asociación Celíaca Aragonesa, Asociación de Celíacos de Cataluña, ATUDEM, ARAMON. muy muy util el post para los buenos esquiadores sin gluten!! !